COPENHAGEN — Norwegian officials have opened an investigation into why a cruise ship carrying more than 1,370 people set sail along the country’s often wild western coast despite storm warnings, forcing a major rescue evacuation by helicopter. Hospital officials have said one person is in critical condition and eight others are still hospitalized after the Viking Sky had engine problems off the Norwegian coast and issued a mayday warning on Saturday afternoon. The Viking Sky had left the northern city of Tromso and was headed for Stavanger in southern Norway when it ran into trouble. The ship anchored in heavy seas to avoid being dashed on the rocks in an area known for shipwrecks over the years. 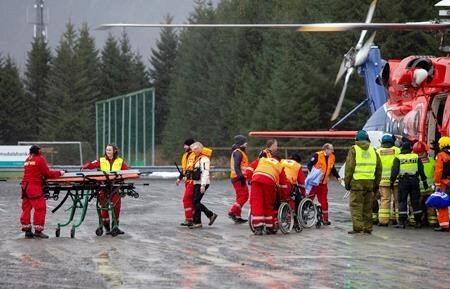 Norwegian authorities then launched a daring rescue operation despite the high winds, eventually winching 479 passengers off the ship by helicopter in an operation that went on for hours Saturday night and into Sunday morning. The rescue was also hampered when two of the five rescue helicopters helping the Viking Sky had to be diverted to save nine crewmembers from a nearby listing cargo ship. The rescue workers managed to take a little more than half of the passengers off the cruise ship, but some 900 passengers and crew were still on it when its captain made the decision Sunday just before noon to halt the evacuation. It is now docked in the Norwegian port city of Molde, 390 kilometres (240 miles) northwest of Oslo, which it limped into Sunday afternoon on its own engines. Liseth said investigators were headed to Molde on Monday and declined to speculate as to why the Viking Sky captain had decided to sail to Stavanger in the first place despite the intense weather warning. He couldn’t immediately say how long the cruise ship would remain in Molde. Yngve Skovly, of the police force in Moere and Romsdal district where Molde sits, says there is no suspicion of a criminal offence but police have opened an investigation to find out why the ship had engine problems. That probe would be part of the one by the Accident Investigations Board. The Viking Sky is a relatively new ship, delivered in 2017 to operator Viking Ocean Cruises. The ship was on a 12-day cruise along Norway’s coast before its scheduled arrival Tuesday in the British port of Tilbury, on the River Thames. The passengers were mostly an English-speaking mix of American, British, Canadian, New Zealand and Australian citizens. All the cruise ship passengers were expected to be flown out of Norway by Monday evening, police said. On Sunday, the operator said the Viking Sky’s next scheduled trip, to Scandinavia and Germany, which was to leave on Wednesday, has been cancelled but no other trip cancellations for the ship were foreseen yet. Calls to Viking Ocean Cruises on Monday were not immediately returned. 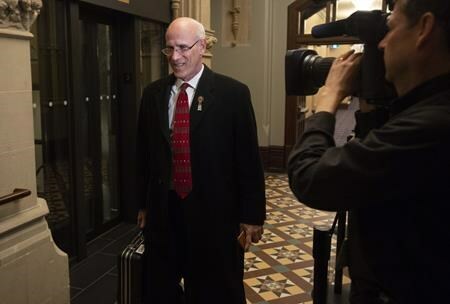 OTTAWA — Michael Wernick, the clerk of the Privy Council, is bidding farewell to the more than 200,000 workers in the federal public service. Wernick announced in mid-March that he would leave his post as the top federal bureaucrat prior to the fall election campaign. At the time, he told Prime Minister Justin Trudeau in a letter that he would no longer be able to fulfil central aspects of his role, including being an impartial arbiter of whether foreign interference occurs during the campaign and to help whichever party is elected to form government. He said it become apparent there was no path for him to have a relationship of “mutual trust and respect with the leaders of the opposition parties” in the wake of the SNC-Lavalin controversy. His farewell message expresses how proud he was to serve as clerk of the Privy Council and reminds those still working in government that what they do matters. He says a non-partisan public service that is “guided by values, fuelled by evidence” and “a never-ending quest to learn” is key to the success of the country.